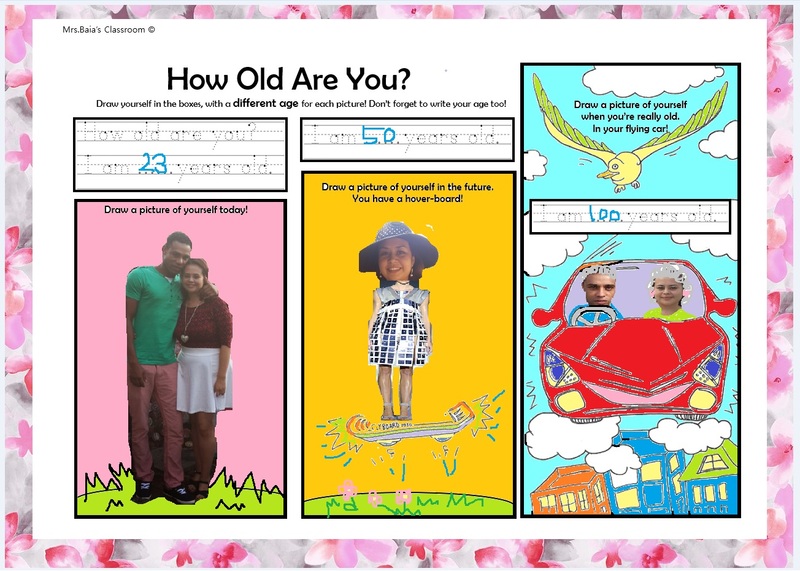 My newest creation is a "How Old Are You?" 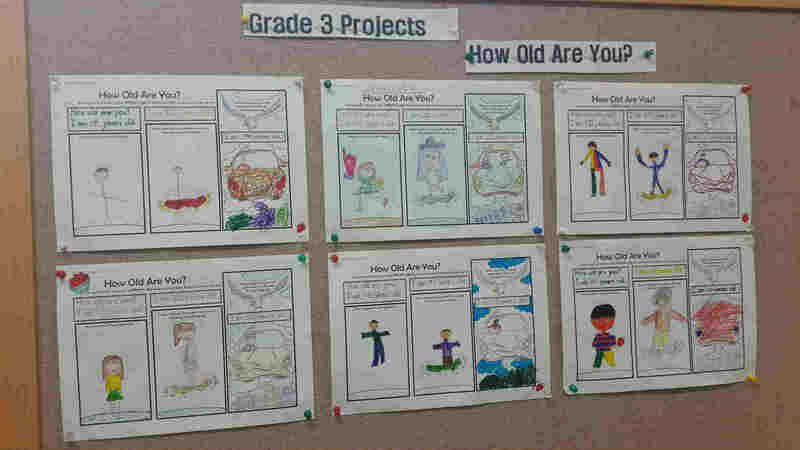 drawing and writing worksheet for grade 3. We are studying the lesson on numbers and age in my class. 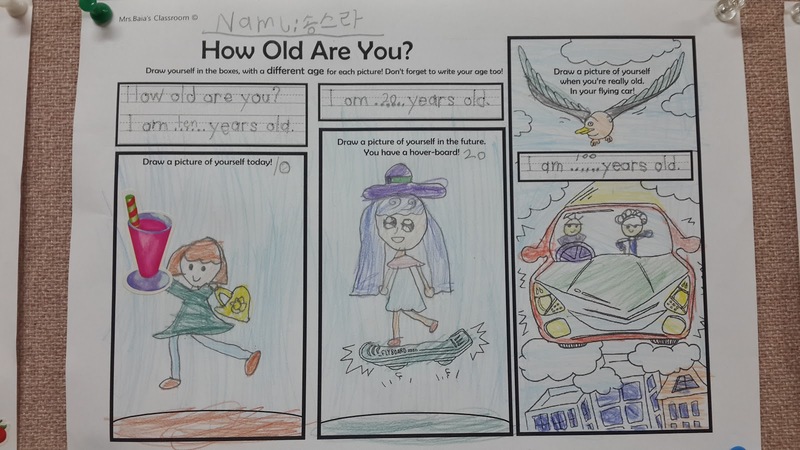 I wanted to do a worksheet that incorporated the key phrases "How old are you?" and "I am ___ years old." I made the worksheet to be a fun activity for the little ones as they love to do creative things. By the way, this is an awesome cartoon for the kids to watch. If you haven't seen the Gogo series yet, get on it! They have some great cartoons that match ESL topics and the kids really enjoy them. Below is my own paint made demo for my kids! They love when I show them a demo and they love it even more when they see photos of my husband and I. For some reason me being married is still a novelty. Some of my students have also met Peter, (hubby) as I live in a small town, so it's added fun. (They call him Peterpan). (Please excuse the bad number writing, paint is hard ! The ages I chose are my current, 23 then 50 and 100. Hence, the grey hair! hehe). I tried to find some futuristic clothing to match lol. The students should fill in and practice their handwriting first in the spaces provided. The textbook is very low level when it comes to writing, which is fine for most but my students are actually quite good at writing and so I think the worksheet is a good amount of practice for lettering as well as spelling the key words of the lesson. They are supposed to write their age in present day for the first box and then draw themselves in the box below. They can spell the number out for present day age, as it will most likely be "ten" or "eleven" at most. Small enough to fit in the handwriting space. 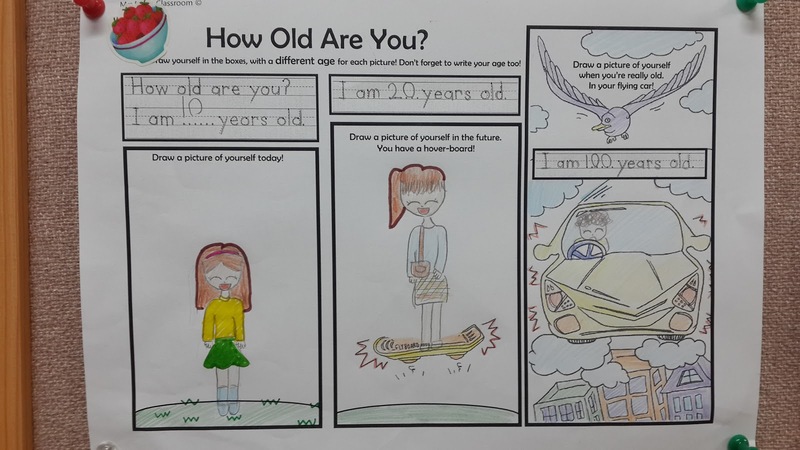 The next box, centre, will be for any age they choose in the future - encourage them to draw themselves as adults, and here, they can write the number in digits. They also have to draw themselves riding a hover-board! I was inspired by the film Back To The Future , of course! 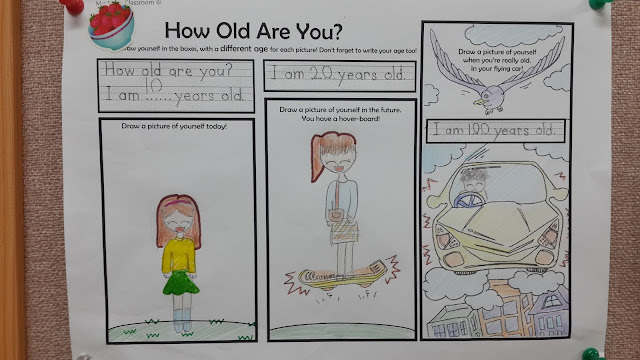 For the last box, they are to draw themselves "old" driving in their flying car - as I hope by the time they are old we have flying cars! haha! I will be doing this activity next week! Can't wait. I award them with a sticker and coupon if they have beautiful handwriting and colored work, as well as completing the activity. Perhaps for this, I'll give a candy or double coupons to the best work. (best handwriting and presentation overall, it really works well in my class to single out those who have tried their best, the other students have become more motivated to take presentation and handwriting more seriously now). I hope you can use this in your upcoming grade 3 lessons or for any ESL lesson on age! Like fun worksheets like this? Try my cut and paste "What do you want to eat? food worksheet!